I filmed the 3rd Queerfest. At one moment I realized that the story, which was happening in front of the camera, was not just the report video about the Festival. These materials I was filming could become an interactive web-project. Later I became more familiar with political context and developed more close relations with people I met at the Festival. All these interested me more and more. 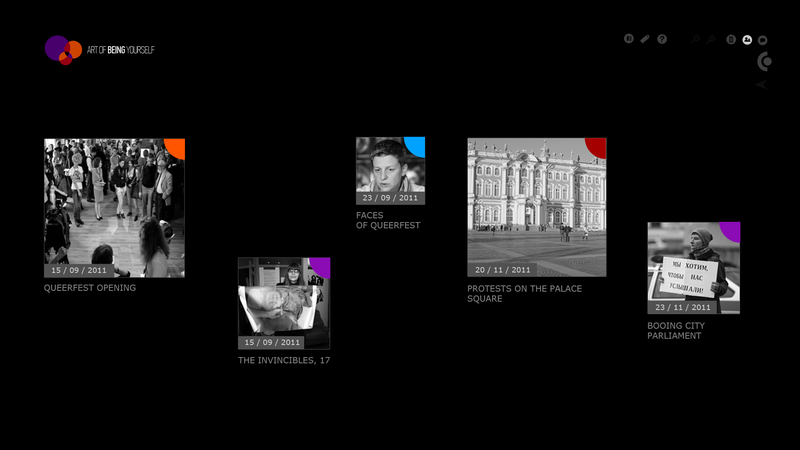 I invented the story that could show the life of LGBT community of St Petesburg in the interactive way. 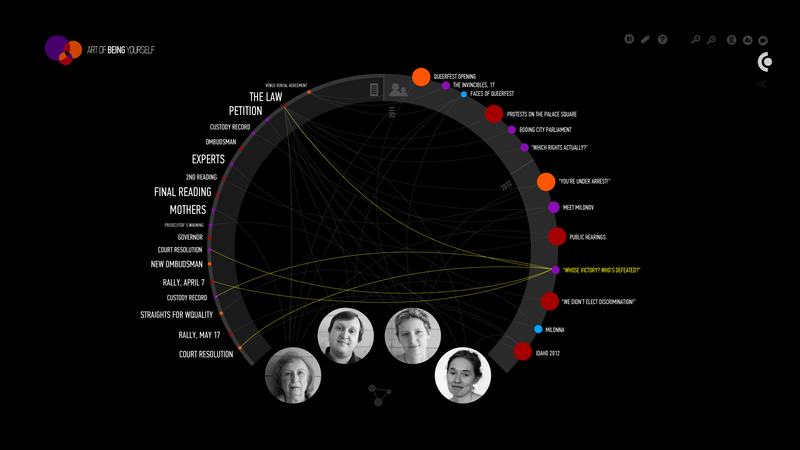 The model of interactive documentary web-project is installed on the festival – this is the social research using authors’ tools that allows creating complex narrative nonlinear structures. The base of the project is the innovative form of storytelling. By adjusting the type of displaying the «layers» of the content (documents, social processes, personal speeches): zooming-in the event, comparing elements and studying conceptual relationships of “layers” on the main (infographic) plan user is able to get powerful tool for the analysis of the material. Principle of developing narrative that is put into the base of the program gets visual picture in the dynamic infographics. This infographics allows analyzing nonlinear large amounts of multimedia data. The concept of universal software solution for comprehension of complex events is represented thru unique documentary material - chronicle of one of the key life periods of LGBT community of St Petersburg. The project will be developed in future. It is planned to attract the attention of the society to the issue of homophobia, transphobia and minorities discrimination. Project is potentially able to become a platform where the discriminated group can talk and protect its political and civil rights. When one is reasoning on any topic, he always “speaks for himself”. Each of our thought, each social and cultural motion is filled with our personality, our individual story, our tolerance. Philosophic concepts of Jacques Derrida, Roland Barthes, Jean Baudrillard, Judith Butler and many others are who they are only because each of their word consist personal stories. My gender identity is floating. It always amuses me when I watch how this fact affects my worldview and my art. I don’t like unambiguity. It is difficult for me to exist within linear structures. I think that physical, social and mental realities are nonlinear and complex. Mutually exclusive models get along with modern world because presently oppositions like male/female, general/particular, genuine/false are no longer relevant; they are simultaneous and equal options of the reality. The main miracle is that the arrangement of this world allows complexity and it is always bigger than we can see. It’s not enough to move linear towards borders of mutual opposite. Picture of this world has been constructed for centuries of classic science, classic western thinking. Now the picture of this world changes dramatically, not only because the reality has become nonlinear (it always was like this), but because now we have the possibility to think about it. Like the flat world of paper or screen unable to reflect real dimension of space – constructing concrete, simple, linear theories usually unable to reflect living reality. Moreover, such thinking can be dangerous within nonlinear complex world. It is dangerous to put yourself, once and for good, into frames of one rigid theory, no matter which theory it is, no matter how attractive and accurate it may seem. I like the image of fire as an idea of constant motion, transformation and the process of changing conditions. Opposite concepts don’t necessarily exclude each other. They are one whole piece. They exist in organic interaction, dividing, interflowing and going into each other. Conventionality and marginality, autonomy and dependency, objective and subjective, altruism and egoism, separatism and unionism, chaos and order. My attitude is synergic in its core. And the idea that as the base of stability, viability of structures lays the diversity of merged elements – this is close to me. I would also say that the principle “unity thru diversity” could become not only the motto of our project, but the core of all my searches. I don’t believe in existence of one single power. I don’t like simple interpretations. And the last passage confuses me.